What the heck is skeleton? When you were a kid, did you like to go sledding? Well, some of us never grew out of it, and skeleton is just super sledding for big kids! 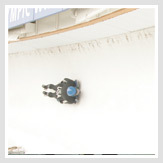 Skeleton is a winter sport, where we slide headfirst down the same track as bobsled and luge, at speed reaching 80-90 miles per hour depending on the track. It's a sport of strength and power and explosiveness, and also a sport of finesse and calm and subtle skill. It's a mad adrenaline rush and zen meditation rolled into one, and I love it! Then, within a 30 second countdown, you need to push off the block, run with the sled, and jump on. It's important to get as much accelleration from your push as possible; it's a gravity sport, so every hundredth you lose at the start is an exponential loss as you slide down the track! Once you load, the groove is gone and you must steer the sled down the track. Surprisingly powerful G-forces keep you on the walls of the curves, like this. Each run takes only a minute or so depending on the track, but it feels like much longer. Races are won and lost by hundredths of seconds, so any mistake is costly. We train both physically and mentally all summer in preparation, and during the race season make sure that every single training run counts! If you are near the west coast, contact the Utah Olympic Park, or if closer to the east coast, contact ORDA, at the links below. 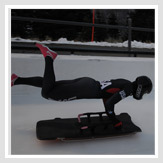 Or, you can also contact the USBSF to take a combine test - a baseline fitness test - and if you do well, maybe get invited to a training camp!